The first set of official standards was released on September 1, 2015. A new messaging standard promised to change the way airline tickets are distributed. This will help service suppliers bring personalized content directly to OTAs, TMCs, and metasearch engines, bypassing Global Distribution Systems (GDSs). As a result, NDC was supposed to break the oligopoly of GDSs that formed over time. 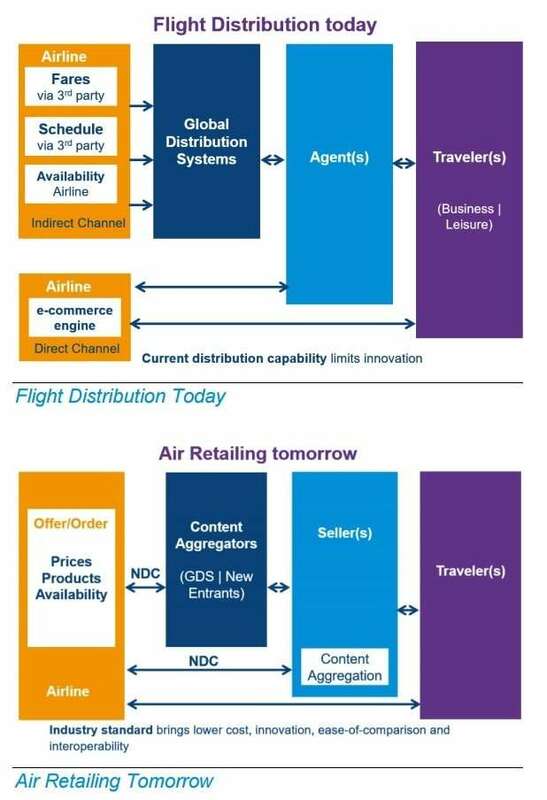 To understand the current situation in airline distribution and get a detailed background on why NDC has emerged, we need to look back in time. The distribution system in the air travel industry includes many players in the field. To link end customers with the actual airline, there are a number of intermediaries, represented by travel agencies, tariff publishers, GDSs, and so on. Most of the major players appeared decades ago or morphed from the older formations and continue to exist. To quickly learn how distribution in airlines works, you may check our video and get back for details. Let’s have a deeper look at the airline distribution landscape from the historical perspective. 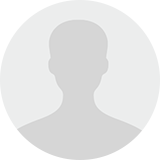 This will allow for a comprehensive understanding of the current state of NDC adoption and the roles of the players involved. The timeline of flight distribution in the air travel industry. Flight distribution automation. In 1964, IBM and American Airlines developed the first computer reservation system Sabre, which is still around today. Sabre allowed American Airlines ticketing agents to search for flights using digital inventory, make reservations, and confirm them via computer terminals. It also decreased the error rate and gave access to customers’ PNR (Passenger Name Records). Sabre quickly became a serious advantage for American, resulting in the appearance of more Computer Reservation Systems (CRSs). Central reservation systems emergence. 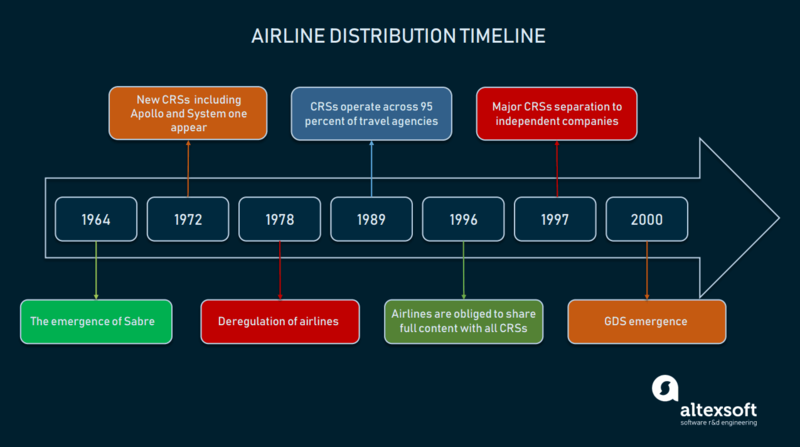 Until 1972, nearly all major airlines in America adopted their own customized versions of CRSs. All of them originated from PARS – a standardized system for medium-size carriers by IBM. Bringing terminals to travel agents. During the 1970s, all CRS providers struggled to bring their systems to travel agents, installing terminals at their offices to make searching for flights and booking semi-automatic and remove the booking load from airlines. The American Society of Travel Agents and airline platform providers attempted to create a unified CRS for all travel agents. As a result, in 1976 United, American, and Eastern airlines shared access to their CRSs. Airlines offered to travel agencies long-term contracts, for which they supplied hardware, software, and training for a monthly subscription fee to get most of the bookings made via CRS. In exchange, travel agents were obliged to book more via CRSs. Price independence. The Airline Deregulation Act of 1978 allowed airlines in the USA to set the price for fares independent of government regulations. This influenced the market and the demand for CRSs among travel agencies increased even more. Mass CRS adoption. By 1989, over 95 percent of travel agents signed contracts with CRS providers, and 75 percent of all tickets were booked via travel agencies. GDS emergence. After 1996, the US Transportation Department obliged airlines to share the same content from their inventories across all CRSs equally. Meanwhile, CRSs started to become independent businesses. For instance, Galileo CRS, created by European airlines to compete with Sabre, went public in 1997. Amadeus, another European CRS, did the same in 1999. Sabre became fully independent of American in 2000. That moment can be considered as the point of Global Distribution System (GDS) emergence in the world as CRS providers grew into GDSs and became an independent, fast growing power, morphing from inventory instruments to monopolists in air travel distribution we know today. GDS consolidates travel data from various service suppliers and allows travel agents to search and book flights. So, for the travel agencies and for customers as well, it’s not necessary to connect directly to each supplier. Currently, the major GDSs are represented by Sabre (including Abacus), Amadeus, and Travelport (Apollo, Galileo, and Worldspan). This doesn’t mean that CRSs have disappeared. They became the parts of passenger service systems, or PSS, which also include airline inventory and departure control systems. Web distribution. At the end of the 1990s and the beginning of the 21st century, the Internet was gradually changing the way flights were distributed. The Internet era forced each and every player to go online. Airlines started to build websites to offer their services and post schedules. Carriers also invested in metasearch and booking engines such as Hotwire, Orbitz, Kayak, and Skyscanner. Meanwhile, GDSs settled Internet connection, providing travel agencies with the software to build their own websites. So, new channels of distribution came up via the web, and online travel agencies (OTAs) emerged. ATPCO, or Airline Tariff Publishing Company, is engaged in fare and fare-related data collection, providing it to GDSs, their related travel agencies, OTAs, and fare search engines. OAG, a United Kingdom-based provider of digital data and applications for the flight industry, manages the largest flight schedule database for over 4 thousand airports. Innovata is another schedule database provider, being a strategic partner of IATA. In a GDS-centered distribution, these tech providers play an important information role, preventing airlines from fully owning their data. For instance, to change prices, airlines must publish them via ATPCO first. A new issue appeared during the late 2000s. GDSs failed to support airlines in sharing their rich content across OTAs, giving no options to merchandise additional services, thus cutting down revenue. According to the IdeaWorks’ ancillary revenue report of 2009, worldwide ancillary revenue reached €11 ($13.5) billion. Without any doubt, offering bundled services to the right customers became a critical task for service suppliers. But, the GDS oligopoly with its old-world EDIFACT protocol technically doesn’t allow for distributing rich content and acquiring customer personal data. Generally, two main events impacted NDC emergence and its further adoption among airlines. American Airlines vs Sabre lawsuit. The lawsuit was initiated by American Airlines and US Airways to persuade a jury that Sabre was in violation of the US antitrust law. The carriers sought compensation for financial losses associated with the Full Content Agreement that GDSs force airlines to sign. According to the agreement, carriers had to publish all their inventory via GDSs. The lawsuit, which lasted over 6 years, resulted in Sabre having to pay $5 million in compensation. The case attracted the attention of industry representatives. The jury found the Full Content Agreement unlawful, but the compensation didn’t even cover 1 percent of American Airline’s losses. Lufthansa GDS surcharge and direct bookings. The German flagship airline, Lufthansa, in the summer of 2015 announced that it would surcharge every booking made via GDS €16 ($18). The initiative was called a Distribution Cost Charge, and it put a lot of pressure on travel agencies, as it was a step away from the traditional GDS distribution model. Nevertheless, Lufthansa took further action, paying travel agencies one euro for every flight booked via their NDC channel. British Airways and Iberia began penalizing bookings via GDS. The charge was £8/€9.50 (about $11) respectively. In 2017, Lufthansa moved away from GDS and established direct channel bookings on their website. The Lufthansa Group began offering discounts for booking via their NDC channel. This move led travel agencies to invest in direct connection technical infrastructure needed to create a GDS-free middle ground. As an IT provider, Farelogix got a contract with Lufthansa to expand its NDC API, and support its adoption among travel agencies using it. Currently, representatives from nearly all parties in airline distribution have embarked on the NDC initiative one way or another. According to the latest IATA NDC program update, the list of certified deployments reached 65 carriers. The number seems to have grown significantly since 2017 when IATA reported only 50 airlines adopting NDC. But, compared to the overall number of airlines connected to the major three GDSs, which is over 400, NDC adopters seem to be a minority. The report also includes information about the 46 IT providers offering NDC solutions development and implementation. In 2018 IATA published a presentation of NDC standards, that includes new data on the number of airlines adopting NDC and IT providers. 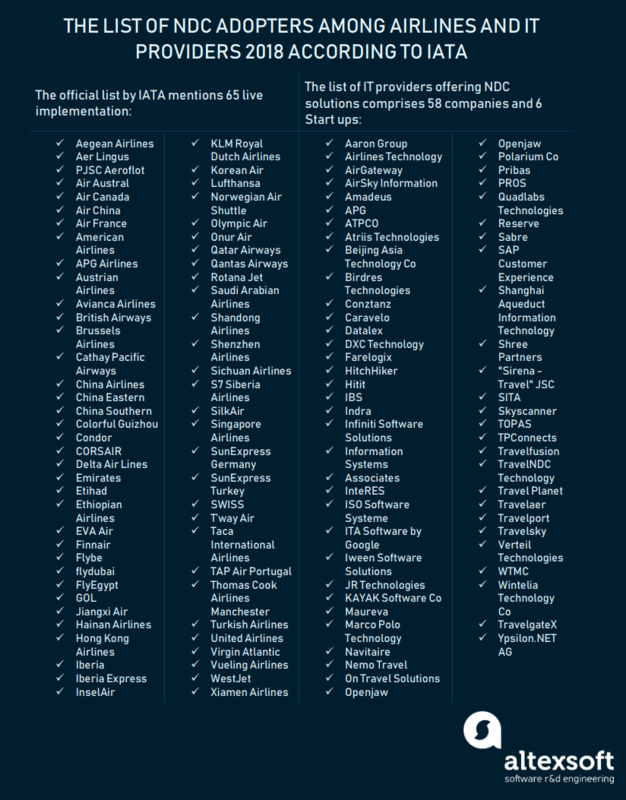 The list of airlines that adopted NDC and IT providers certified by IATA. Major airlines managed to develop their NDC solutions, which sometimes differ in implementation. Here are some examples of NDC implementation across airlines. Lufthansa was the first one to introduce a GDS surcharge and implement direct booking connection in its distribution. Currently, Lufthansa’s direct booking includes several distribution channels: travel agencies direct, aggregators, supplier mobile application, and supplier website. While its NDC version allows for offering rich content, the support of personalized bookings is still to be reached. British Airways developed an NDC solution and integrated it with Kayak. Now their tickets are available directly through the Kayak platform. British Airways API allows for distributing through the following channels: direct connect through OTAs, IATA’s travel agents, GDSs, and online booking tools. Similar to Lufthansa’s API, British Airways doesn’t support personalized bookings yet. Air Canada allows their API to be used freely across all channels. It seems that Air Canada presents the fullest range of NDC “advantages” for the moment, providing rich content, personalized bookings, airline profiles, air, and non-air related ancillaries. Flydubai also has a competitive NDC implementation, being relatively equal to what Air Canada offers. The only difference is that Flydubai allows for distribution only through travel agencies and OTAs. So, only a few among the NDC adopters have managed to present the full range of NDC benefits. Others are still establishing the connectivity between the distributors to get their direct channels to work. SITA, a global tech (IT) and communications provider in the airline industry. As SITA has a partnership agreement with ATPCO, they developed an NDC Exchange platform. NDC Exchange is an industry-owned platform that will help to deliver air price content via NDC APIs. Farelogix is a technology company that provides SaaS (Software-as-a-Service) NDC solutions for American Airlines, Air Canada, and Delta. In 2017 it was announced that Farelogix will be acquired by Sabre, the deal to be sealed in early 2019. OpenJaw Tech is an IATA certified strategic partner that also provides NDC solutions for the market. OpenJaw Technologies is known for supporting such airlines as British Airways and Iberia. IATA has also chosen OpenJaw Tech to be their One Order strategic partner. Travelsky is a Chinese general IT provider of SaaS solutions to NDC adopters. All the IT providers should be certified by IATA to develop their tech solutions for the airlines and other third parties. The certification NDC program can be found on IATA’s website. Despite being a great opportunity, NDC has at least two major drawbacks that slow down its adoption across all major carriers. NDC is not really a standard. The use of XML instead of EDIFACT is supposed to be a standard, but in reality, the implementations are different and depend on the IT provider. So, there is no real “standard” for all. That means that if every airline would plug into their own NDC pipeline, there would be countless API channels impossible for OTAs and TMCs to integrate with. The only winners in this situation seem to be IT providers. Distributors won’t leave the GDS pipeline. Travel agents are still more likely to use GDSs because they don’t require any changes and still generate revenues. For OTAs and TMCs a switch to NDC means additional expenses which don’t guarantee any benefits. The reason for that is a severe market fragmentation with different NDC solutions and no one-size-fits-all solution. For instance, American Airlines reported 4 million tickets sold via its NDC channel in 2017, which doesn’t look like a large percentage of annual revenue. Today, NDC adoption remains a premium option, rather than a necessity. Considering the fact that distributors are more likely to stick with GDS, you may ask a reasonable question. Why wouldn’t GDSs adopt NDC? The latest announcements made by the major GDS companies point out that they won’t quit the game yet. Obviously, GDS remained an all-purpose option for OTAs and TMCs. All three GDS giants have announced that they are going to participate in NDC adoption as a part of airline distribution evolution. Travelport was the first of GDSs to obtain level 3 compliance as an NDC aggregator, which is a required status to provide NDC services. Travelport’s NDC product was presented in 2017 via a roadmap, and it was announced that the product will be initially designed for airline companies. But the product will be enhanced in 2019 to be integrated with OTAs. SABRE made an official announcement at The Beat Live in October 2018, that it will reach level 3 compliance as an aggregator of NDC. That said, Sabre was recognized by IATA as a level 3 NDC IT provider in early 2018. The compliance level recognition means that the company is compatible with IATA’s NDC standards and is able to provide a full range of services. Amadeus is developing its NDC-X program, and has also reached level 3 as an NDC aggregator. For GDS aggregators, NDC adoption became a vital question. As it’s impossible for GDSs to integrate with each separate NDC channel, they decided to force the adoption of an XML standard for the industry. The process goes even further as all parties of a traditional distribution chain start adopting NDC. In October 2018, ATPCO announced its collaboration with SITA, an IT provider, to develop a simple API for NDC adoption. The New Distribution Capability was supposed to allow airlines to bypass GDS. The current state of the industry vividly illustrates that as of 2019, GDSs are likely to remain the oligopoly even in terms of NDC adoption. As airlines will still be able to merchandise their additional services through NDC pipelines, they seemingly have achieved their goals. But the question is more about the transparency now, as it is a big question whether GDS NDC aggregators will allow carriers to directly reach their customers. The only party left in uncertainty are distributors represented by various travel agencies that will have to wait until each airline/GDS is ready to switch to its NDC solution.